I wrote a little about this one years back (has it been years?) and so left it to nearly the end of my Marxian odyssey this time (for late-comers, I’m writing about those aspects of the Marx Bros films excluding the Marx Bros — what are usually considered the bad bits). A NIGHT IN CASABLANCA sees the three remaining Bros at United Artists, in 1946, in a largely studio-bound version of North Africa. Plot revolves around Nazi gold and art treasures, then I imagine quite a new McGuffin. It’s probably sensible that the Marx films skipped the war years altogether (if one considers WWII from an American perspective) and refer to the Third Reich fairly obliquely here. The film is deftly directed by Archie Mayo, with a surprising amount of fluid camera movement. It’s questionable whether a Marx Bros film NEEDS fluid camera movement, but it’s getting it regardless. And despite the limited budget keeping us in a hotel for most of the plot (when the boys escape jail and steal a plane, they crash right back into the jail again, thus saving on further sets) it looks pretty good. No Margaret Dumont, alas, but Sig Rumann is present and incorrect as Pfferman the German. He’s a Nazi-in-hiding with a giveaway scar on his head (I’m imagining an unfortunate encounter with the Inglourious Basterds) for which he requires the camouflage of a toupee. Harpo is set up as Rusty, his put-upon underling, a role that dates back to A NIGHT AT THE OPERA and Thalberg’s unfortunate attempts to sentimentalize Harpo. Still, it means we can have lots of scenes of Sig being driven to apoplexy by Harpo and later the other brothers. And he keeps his clothes on this time. The sight of his genital cluster swaying within his long johns in A NIGHT AT THE OPERA will follow me to my mausoleum. Sig comes complete with henchpersons, the oily Kurt and the seductive Bea. Kurt is ably played by actual German Frederick Giermann, and gets a decent sabre duel with Harpo. Giermann is one of countless fugitives from the Nazis who enjoyed a few boom years in Hollywood playing the guys he had fled. His career dries up not long after the war. Bea is the excellent and lovely Lisette Verea, who seems to be genuinely having a ball, and is particularly good with Groucho. The nice girls in these films are always a bore, but the vamps are generally great value. Better, Verea gets to convert to the side of good, meaning she can get chased offscreen by the Bros at the end. This Romanian vixen was in just two films, the other being the 1933 version of THE GHOST TRAIN, which I bet is aces. ALL versions of THE GHOST TRAIN seem to be thoroughly entertaining. Frank Tashlin worked on gags for this one, including Harpo’s first scene, leaning against a wall, getting moved on by a policeman (“Say, what do you think you are doing, holding up the building?”), at which point the full-sized building collapses. He may have also devised Groucho’s deleted entrance, in which his small desert hotel blows away in a sandstorm. The movie has obviously suffered quite a bit of this “tightening” — despite which Chico and Harpo’s musical numbers remain intact — numerous scenes fade-out in mid-action, or with characters opening their mouths to begin new quips. Who knows if there was gold in the lost footage? The remaining film has its longeurs, and the inelegance of the cutting does make me wonder if they snipped out the wrong bits. Chief among the longeurs, of course, are the romantic leads, but the movie gives them short shrift, for which we can be grateful. Their names are Charles Drake and Lois Collier, and they can’t help themselves. And the script doesn’t exactly go out of its way to help them either. Of Mr. Drake, the IMDb says “No change in popularity this week,” which strikes me as beautifully apt. Collier had a much shorter career than her co-star, but most of her characters had names. This pair doesn’t get a lot of screen time — the movie actually seems to forget about them midway, and it’s a surprise when they crash back into the plot. And at least they don’t sing. Lisette Verea does, briefly, and the number chosen, Who’s Sorry Now?, is a very good one, and it’s nice that it’s by Kalmar & Ruby, who wrote Hooray for Captain Spaulding! and Whatever It Is, I’m Against It, and who are the chief credited writers on DUCK SOUP. Who else? Perennial bit player Paul Harvey plays Mr. Smythe, who can’t get a room in Groucho’s hotel without showing his marriage license. Mr. Harvey was born in Sandwich, Illinois, which makes me warm to him. Sig Rumann was a Hamburger — perhaps he would have bonded with the Sandwich man also. There’s an extraordinary-looking thesp called David Hoffman as an Arab spy. And Dan Seymour as the Prefect of Police, his beard dismissed by Groucho as a terrible case of five O’clock shadow. And, we are told, Ruth Roman as a harem girl, but I failed to spot her. The movie is a big step up from THE BIG STORE, it seems to me, and lets the Brothers be properly anarchic and only incidentally noble. Though the best bits of OPERA and RACES are up there with the best bits of anything else, I can’t help feel that the Marxes made a mistake, essentially, in signing with MGM — this movie liberates them from the Thalberg influence. The studio where they SHOULD have found a home, Warner Bros (the most brazenly Jewish, most leftie, most proletarian, and most casually vulgar studio) threatened to sue over the use of the word CASABLANCA in the title here. 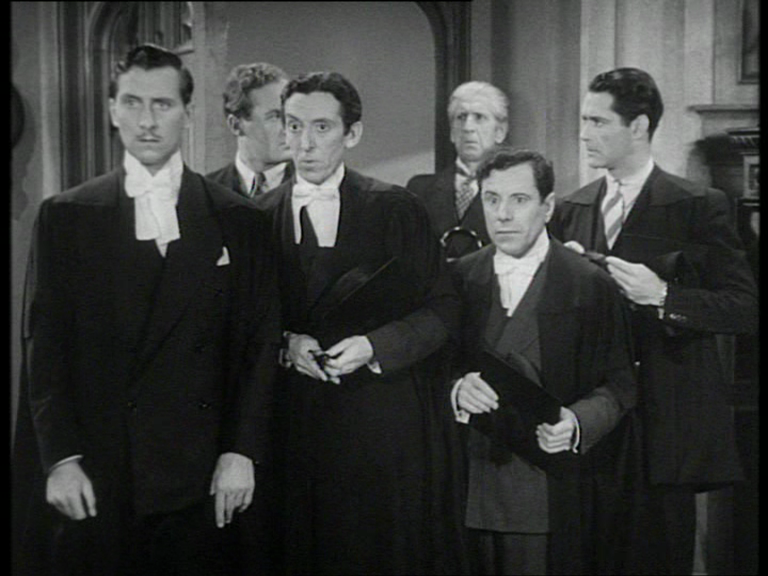 Groucho threatened to counter-sue over the use of their word BROTHERS. Despite someone NEARLY saying “Round up the usual suspects” and a Groucho-Lisette riff on “You know how to whistle, don’t you?” from TO HAVE AND HAVE NOT, there’s little of Bogart here, though Groucho’s tent-like white jacket may be a clown version of Rick’s evening dress. A more actionable version could be imagined, with Groucho running a night club, Chico as a combined Dooley Wilson and Peter Lorre (“Sure I gotta the lettuce o’ transit!”) and Harpo as… hmm, not sure. Paul Henreid could play himself.